As usual, I go out for one thing and come back with another. This time, I went to look at the sea and came back with pictures of creatures. Do I know anything about creatures? No! So, here are some mysteries. 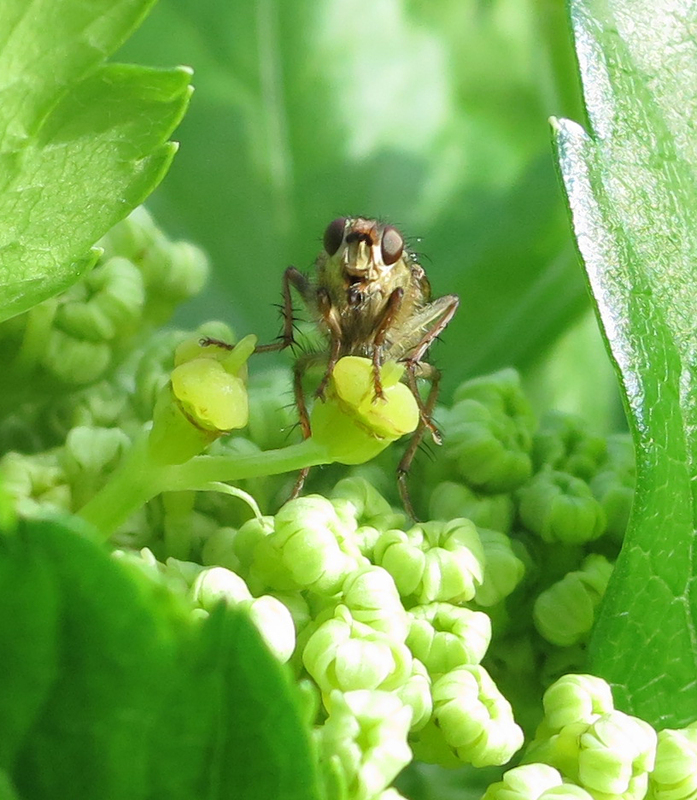 The first is this little fly on an alexanders flower. If I had taken a picture of its back as well as its face, I might have been able to have it IDed. But I didn't. None the less, I am charmed. Indeed, I am so charmed I have set it as my laptop background and I sit here gazing inanely into its eyes (oh, fly! what big eyes you've got!) and admiring its poise, the frog-like angles of its legs. If ever one were able to fall in love with a fly, I have fallen in love with this one. The alexanders (Smyrnium olusatrum) are zooming up. Most years, they do this, then they get zapped by frost and go all droopy. So far, though, so good. Not that it matters. Even if they do get zapped, they recover - and there are millions of them! I've not counted so maybe it's merely thousands. 'Lots' doesn't cover it. They seem to be popular for sitting on. 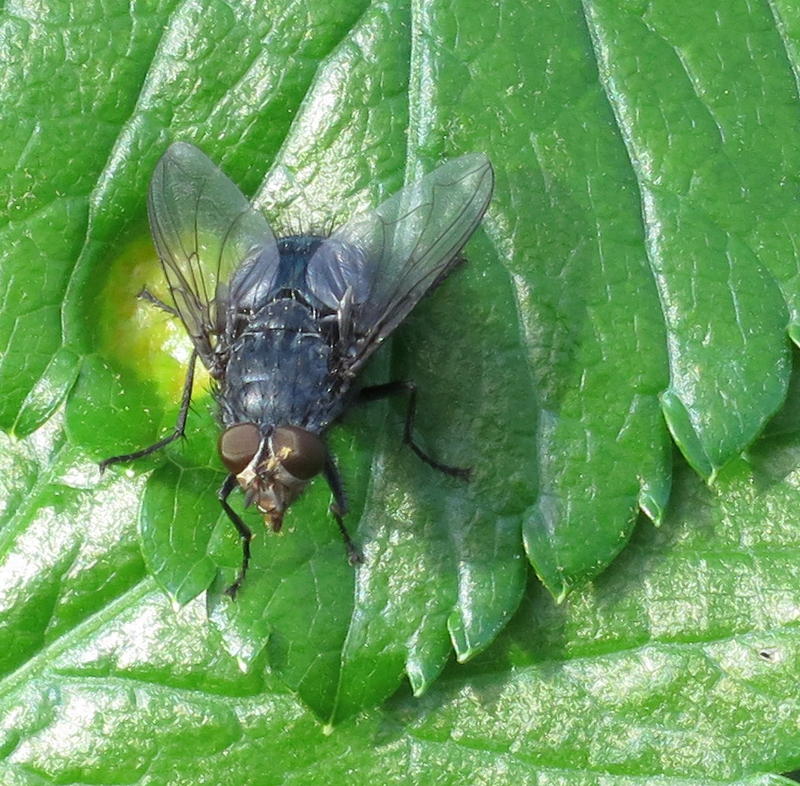 Here's another fly on an alexanders leaf. This one a little bigger. See the round, yellow dent? This is caused by Alexanders Rust (Puccinia smyrnii). For ages, I didn't realise it is a rust and would, each year, poke around looking for insect eggs. Nothing to do with insect eggs. (I'd hoped for butterflies, ah well.) Rusts are a kind of powdery fungus (do not quote me, this is very unscientific language but, unless you are scientist, I think this is a good way to describe it). It counts as 'parasitic' because it harms the plant but it doesn't kill it. This rust, though, does make the leaves look pretty ugly when it gets a hold. Next distraction was that a trench had been dug into the narrow path I use to make my way between brambles and buddleia. 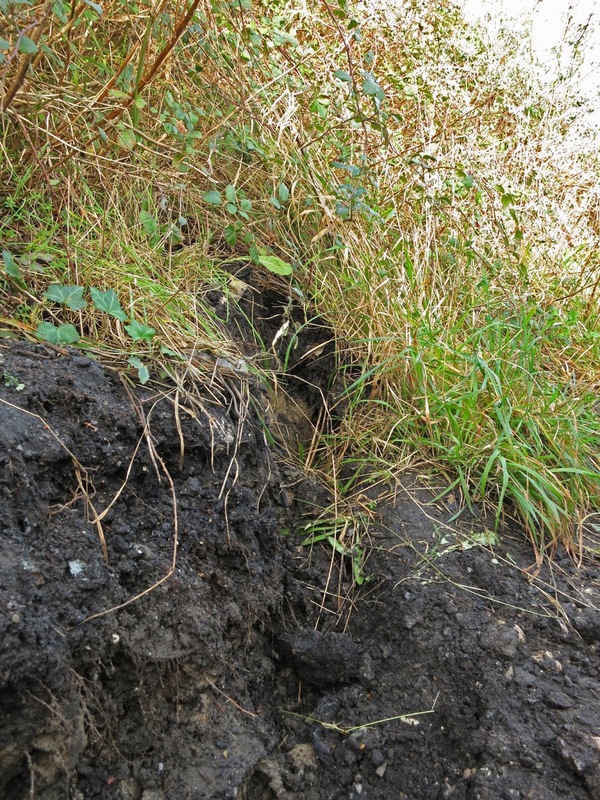 The ground is soft from rain, though not muddy, and some animal has made a huge groove leading to a hole in the bank. It runs for several yards and includes a right turn into what appears to be a dead end part of the way along. But what has done this? Dogs sometimes scrabble around holes but they don't make a massive pathway. I don't know what a fox hole looks like but the BBC Nature Site suggests the area round it smells strongly - and this doesn't. So I'm left with badger. A badger would easily be big enough to do all this digging - and they like grand entrances to their setts. But is the hole big enough? And would a badger do this to a path regularly walked down by lots of humans? It may not be Oxford Street but it's rare one doesn't meet someone here. Two kinds of bird tracks dominated - similar except some were about two inches across and some only an inch and a half. Some footprints are indented with clear indications of a web. 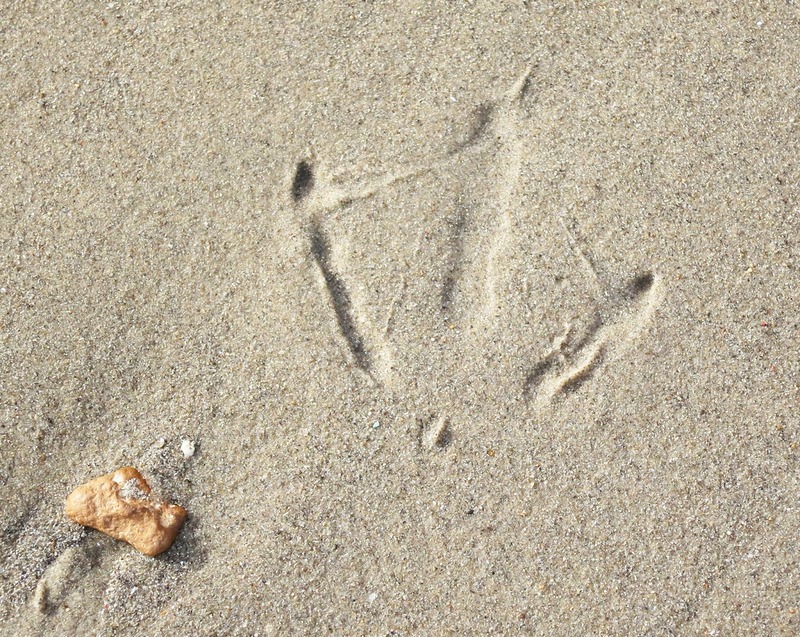 The two crisp holes in the sand beside the track print interest me too. Any ideas? Some have depressions running either side of a ridge and no sign of a web. I don't know whether these differences reflect different foot structures or it's merely something to do with the sand and the water. And, there we have it. Two flies, yellow rust, a dug up path and some bird prints. Not what I went to find - but that's the pleasure of a walk. Hi, Phil - and thanks! Having looked a pictures of Scatophaga stercoraria on Google images - looks like a very likely ID. Looking at iSpot - not many pictures of it there and discrepancy over size. This was about 1.5cm long and very narrow. Would that fit? As always you take me into a different world! I would love to know what made those footprints could it be a geese or swan? One of my fellow bloggers told me hundreds of guillemots have been washed up on the Chesil today -covered in a white sticky substance let's hope they can find out the cause asap. Hi, Sarah. Too small for swans - and although there are many swans along The Fleet, they don't tend to turn up in Portland Harbour. Whatever they were, they seemed to have been running around a lot. I'd guess (GUESS emphasised)the webbed imprints are from herring/black headed gulls and the un-webbed ones oyster catchers. Thanks Mike. I wish it could be more informative! I really shouldn't have looked at that fly in the eye before I'd had breakfast! Hi, Gerald. Do you not find the fly has a very cheerful and relaxed atmosphere? Thanks Boom and Gary. Have been browsing the bird pictures on your latest post. What a friendly, personable fly!Love it! Hi, Susannah. I imagine all flies of this kind look similar. None the less, it's the first insect picture I've taken where the subject matter has had anthropomorphic attitude. 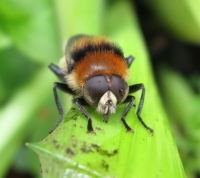 I agree with your comment on my blog about frost being extraordinary...and I would add that flies, plants, and birds are, also! 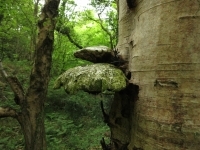 Thanks for showing the interesting and beautiful things you find on your walks! Is there any chance the ditch was created with a flow of water? Hi, Dimple. Definitely not water - clearly dug and leading to the hole. However, it will be interesting to see what will happen when it rains (and it has been raining a lot recently). Hi Mark - that would be fun . . .though it's not my garden path, it's a little public track that goes down to the sea. As much as the idea of a private beach appeals . . . ! I love the shots of the flies...so cute? LOL. Anyways even if I don't find them cute, I am impressed with your shots. 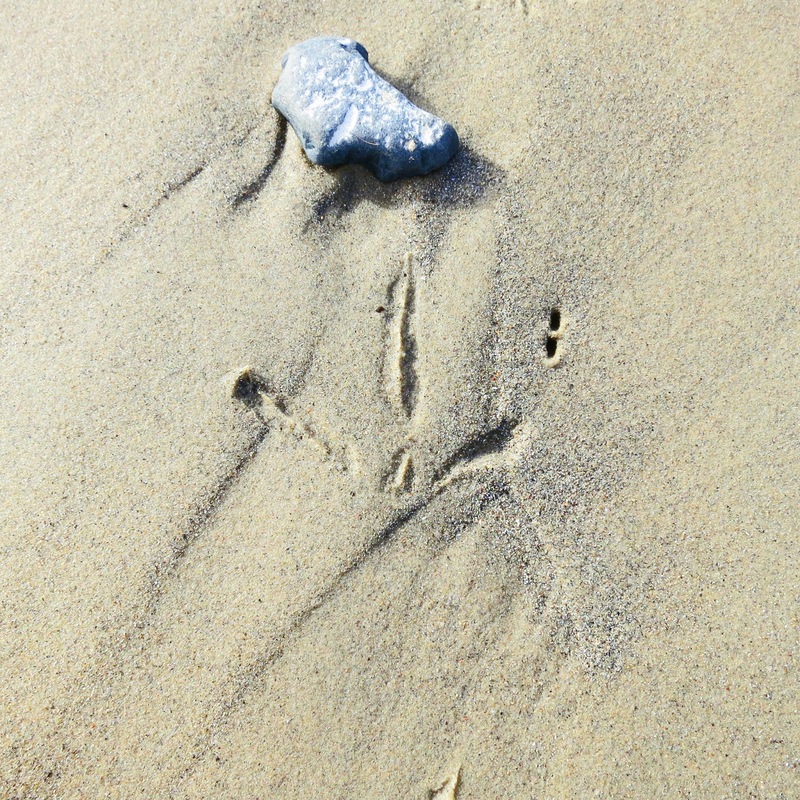 When we lived near the beach, I used to photograph the footprints also. Hi, Jen. Aren't you fascinated by their hairs? I think we humans are missing out on something in the hair line. Before I started taking photographs of plants, I hadn't realised how hairy many of them are. And these flies - with precise spikes sticking out from their legs. And the one on the black one's back - they are like studs in a particularly thuggish piece of armour. Their sphere of perception, proportionally, must be so much greater than ours! Yours is the best sort of walk for discovery...I do have to find time to do a few walks by the lake down the road...that first picture is stunning...I fell in love with the fly as well..
Hi, Donna. It's interesting how different people respond to the same beings. We'll form a fly fan club! Hello Tim. Glad you like the post. I resisted the temptation to say anything about the rust (Puccinia smyrniion)on the alexanders and fly picture on my other blog because that's the kind of blog where visitors are invited to look rather than think. I totally agree. I think you've separated the blogs really well. It allows us to really take notice of your fantastic photography one on site and then to enjoy your essays on the other. Tim - glad you like the division between Loose and Leafy and Message in a Milk Bottle. Thanks for letting me know you like the photos, Pat. Cindy - although it's good to know answers, it's also fascinating to be tantalised by questions, don't you find? You might like to know there's a new post on Loose and Leafy. Spring and Autumn - Can we Tell the Difference?